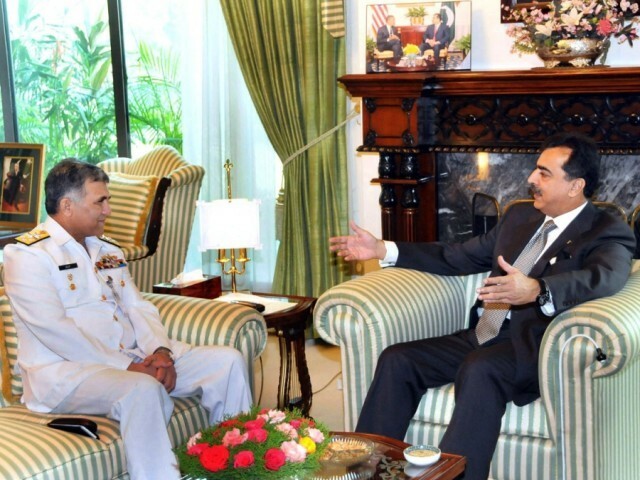 Islamabad: Chief of Naval Staff Admiral Muhammad Asif Sandila called on Prime Minister Syed Yusuf Raza Gilani here at Prime Minister’s House and discussed professional matters of Pakistan Navy. He also apprised the Prime Minister of various welfare projects being undertaken by Pakistan Navy for its personnel in the country and also for the people of Balochistan by providing them education and health facilities. The Naval Chief requested the Prime Minister to grace the forthcoming passing-out parade as the Chief Guest. The Prime Minister agreed to be the Chief Guest on the occasion. The Prime Minister said that Pakistan Navy was the protector of the country’s sea frontiers and assured the Naval Chief that the professional requirements of Pakistan Navy would be met by the government. The Prime Minister also appreciated Pakistan Navy’s initiative to continue to increase the induction of lady officers who are performing equally well in all the Naval branches. This entry was posted in News and tagged CNS, Gilani, Pak Navy. Bookmark the permalink.